Thyme leaves may be small, but they pack a powerful punch. Thyme is the most popular culinary herb besides mint and retains its flavour well in long slow cooking. 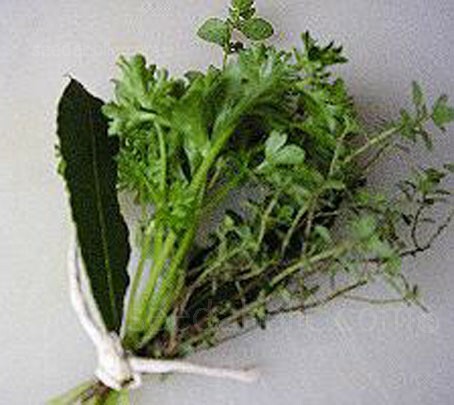 It is one of the savory herbs, which are main course herbs used to flavour hardy meals, bone warming soups, and piquant sauces. They blend their essence with other savory herbs like Tarragon and Savory to create some memorable flavours. 'Winter Thyme' is a low-growing, wiry-stemmed perennial. The stems are stiff and woody and leaves are small, oval, dark grey-green in colour and are very aromatic. It is called winter thyme because it is quite hardy and will very likely winter over without much fuss. Pale mauve-pink flowers bloom at the tips of the stems in summer, the flowers are edible and are extremely attractive to bees. 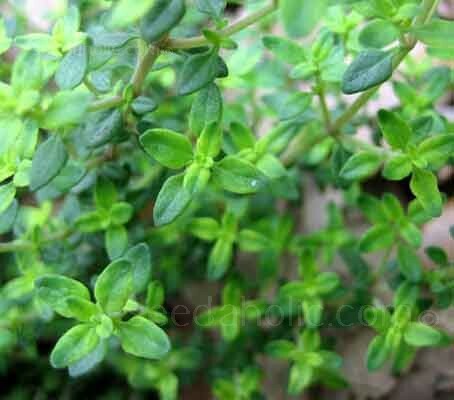 Thyme is an attractive edging plant or a spreading plant among and over rocks, growing best in light, well-drained soil. 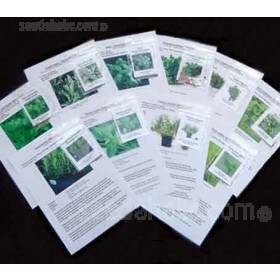 They also make interesting plants for the window sill or in hanging baskets. Sow seed on the surface of lightly firmed, moist seed compost in pots or trays. Do not cover as they need light to germinate. Cover the seed container with a piece of glass or clear plastic and leave in a position which receives diffused light. Once some of the seeds have germinated air should be admitted gradually. Germination 15 to 30 days. When large enough to handle, transplant seedlings into 7.5cm (3in) pots to grow on. Gradually acclimatise to outdoor conditions for 10-15 days before planting out after all risk of frost. For best results, provide any ordinary, well-drained soil in full sun. When transplanting pinch out the tip of each stem to encourage the plants to bush outwards. Plant 30-45cm (12-18in) apart. Thyme, like Rosemary and Lavender is one of those plants which will not re-grow if cut back too hard, if you need to trim them wait until new growth buds appear in the spring and cut back to the lower ones. Leaves can be harvested for fresh use throughout the summer; the flavour is best just before flowering. Harvest sparingly the first year. To store, cut the stems just as the flowers start to open in spring and again in late summer and hang in small bunches to dry. Save some sprigs in olive oil. Thyme aids in the digestion of high fat foods, and is used to preserve meat. Thyme is best known as one of the primary components in a classic bouquet garni. When combined with fresh sprigs of parsley and leaves of bay, it will enliven and give depth to the flavour of soups, stews and sauces. It is popular for its antibacterial and antiseptic properties. Tea preparations are used for sore throats and coughs as well as to improve general immune system functions. It is used as an antiseptic lotion and mouth wash; as an ointment for skin affections and burns and perfumed with lavender, to keep off gnats and mosquitoes. It is also used for embalming corpses. Use two teaspoons of dried herb per cup of boiling water and steep for ten minutes. Add sage to the tea if you have a nagging cough. A stronger tea is useful as a mouthwash or rinse to treat sore gums. Thyme is the companion plant of Cabbages, repelling the Cabbage worm. Dried flowers are used to repel moths from clothing. In Perfumery, Essence of Thyme is used for cosmetics and rice powder. Thyme also enters into the formula for Herb Tobacco. Small, oval, dark grey-green leaves that are very aromatic. Leaves can be harvested for fresh use throughout the summer. The flavour is best just before flowering.